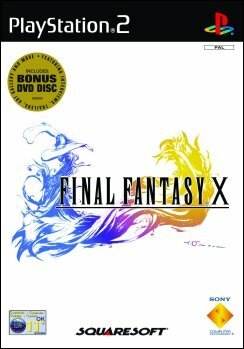 Squaresoft's highly anticipated Final Fantasy X has finally hit the Playstation 2 with extraordinary graphics, storyline and gameplay. Unlike other Final Fantasy games, not everyone can summon the powerful Aeons that inhabit the dream world of the Final Fantasy series. Fortunately for your group of heroes, Yuna possesses this ability and can summon the Aeons to fight alongside you. 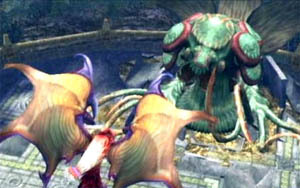 As with other Final Fantasy games, the summoning of these Aeons is probably the most visually impressive feature of the game, apart from the beautifully rendered backgrounds and cinematics. Your group consists of a wide variety of characters that all have their own unique strengths and weaknesses. They include the powerful Kimkari, the black mage Lulu, former blitzball champion Wakka and the wise and powerful Auron. As you travel through the lands of Spira, your characters will slowly become more powerful and discover new Aeons, vital equipment and deadly weaponry. After each battle, your characters are awarded ability points that lets you improve skills and statistics. 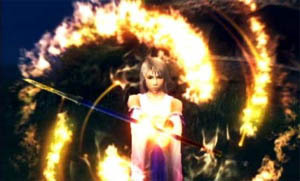 Final Fantasy X has returned to a more traditional style of role playing where each character has a certain sphere of power such as thievery, magic and fighting. 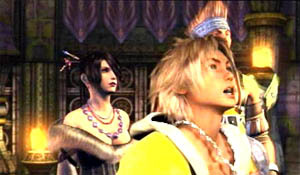 The gameplay of Final Fantasy X is very similar to previous incarnations where characters must travel across the world, solving puzzles and adventures in order to proceed to the final storyline. Along your travels you will encounter a variety of different enemies that you must vanquish in order to proceed. Apart from these random encounters, your heroes must also fight powerful bosses that take careful planning and strategy, in order to defeat them. Brute force will only work so much. Moving your characters around is quite easy and is achieved by using the gamepad or the analog stick. Fortunately, the developers of Squaresoft have changed the fighting system in FFX and you are no longer rushed into choosing a tactic. There is also an option that lets you shorten the Aeon summoning animation from the options menu. Personally I would rather preferred a "skip" key because if you get a new Aeon, you must go the menu and enable it again to watch the cinema. The save system is the same as previous games and you must look for save points throughout the game in order to save. The graphics of Final Fantasy X are truly amazing and is probably the best you'll see on any gaming console. The backgrounds are beautifully rendered and all characters have a high polygon count to ensure as much realism as possible from facial expressions to movement. Apart from the awesome ingame graphics, the movie-like cutscenes are simply the most impressive thing I've ever seen on the PS2. If you want a comparison of how nice these movies are, just check Final Fantasy the movie. Apart from the jaw dropping graphics, the music score of Final Fantasy has been professionally done, whether its the simplistic and calming computer generated music or the fully orchestrated scores that make the Final Fantasy series just so good. All character voices are well acted and really suit the characters. Gone are the days of reading endless text, because everything now is spoken, thanks to the wonders of DVD. The sound effects of FFX are also top class and help set the atmosphere of the game, whether its travelling through a land of snow crystals to the dangerous watery caverns of Spira. 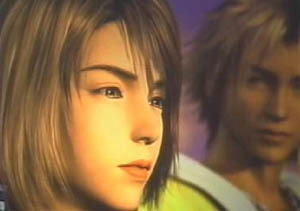 Final Fantasy X is a highly addictive game and is a must have for the PS2. It emerges you into a wondrous magically world of myth and technology. With beautiful graphics and music, Squaresoft have truly made this the next benchmark of role-playing and adventure games to come. Final Fantasy has something for everyone, adventure, puzzles, combat, romance, excitement and best of all fun. Final Fantasy X is almost a 10 out of 10, so don't just sit there, go out and buy this game now! Highly Recommended!